All photos open full size in Flickr if you are interested to see more of the detail. This photo is at full resolution. 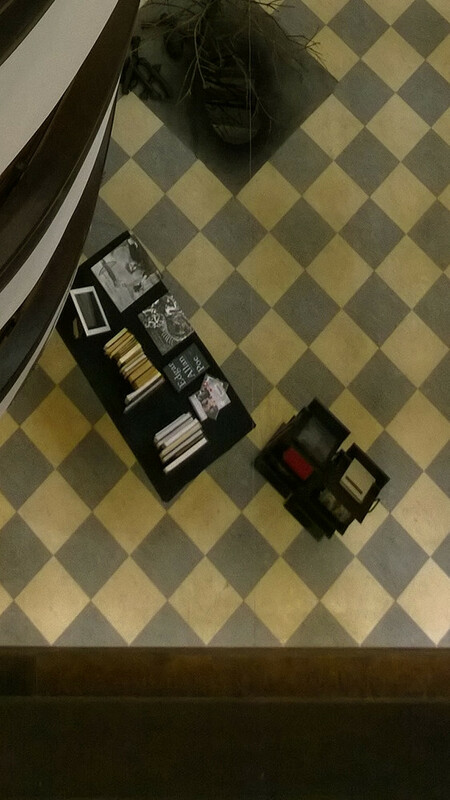 Taken in dimly lit library in Helsinki. Direct crop from the photo. You can actually read that the book is by Edgar Allen Poe. And generally speaking the corner is not where the best resolution of lens is. Slight noise in the photo which is less than I expected. Indoors without a flash and a small sensor compared to a DSLR. 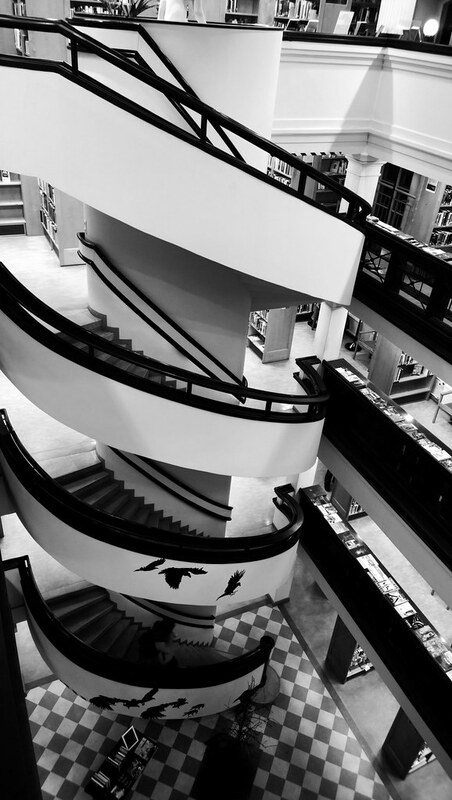 I love staircases so here is an example of the library staircase in monochrome. Another example of the resolution. 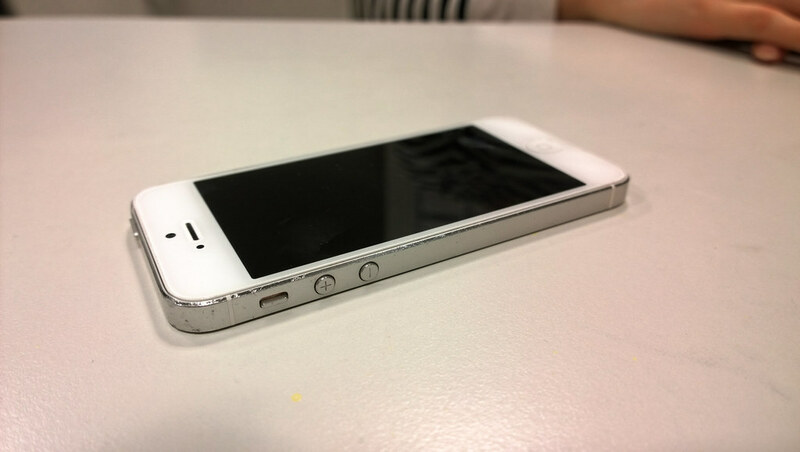 This is the full size photo of an iPhone. 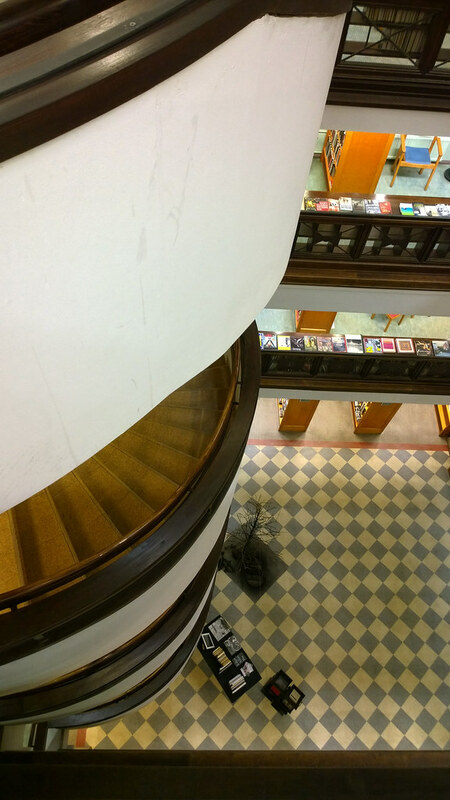 In part three there will be more photos taken with the lumia and my summary of the phone. 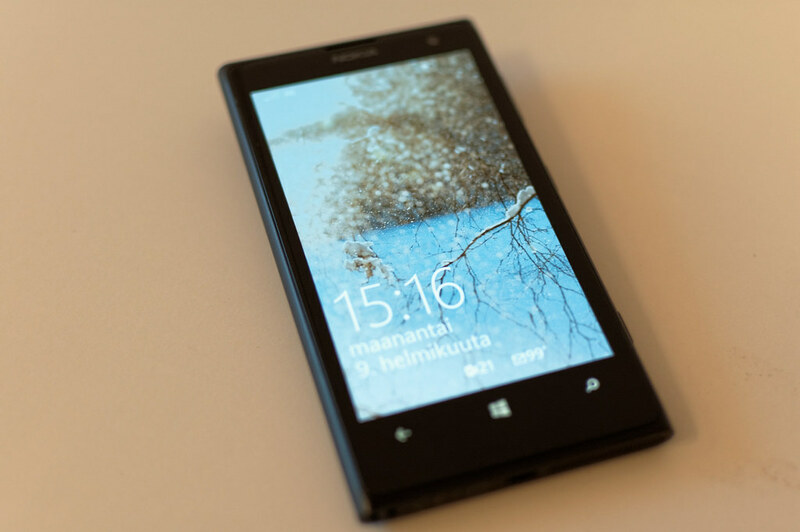 So I had the possibility to test the Nokia(Microsoft) Lumia 1020. A phone that has been out for a while now. But still has perhaps the best camera in all the real cameraphones (there are a couple of models that are maybe more camera and less phone). This is phone first and camera second. The model I had for test was a dull black version, the phone has been on sale in many bright and nice colors, and I would myself pick something else than black anyway when possible. The screen is 4.5″ in size. Small in nowadays terms, as even the iPhone grew big in the current 6 and 6+ models. I think that for most people the sizes between 4-5″ is the best for one-handed use. I have huge hands so I have been always a bit more addicted to the bigger screen versions. Having used the earlier iPhone (3.5-4″ screen) I was constantly pressing the wrong place on the keyboard etc. 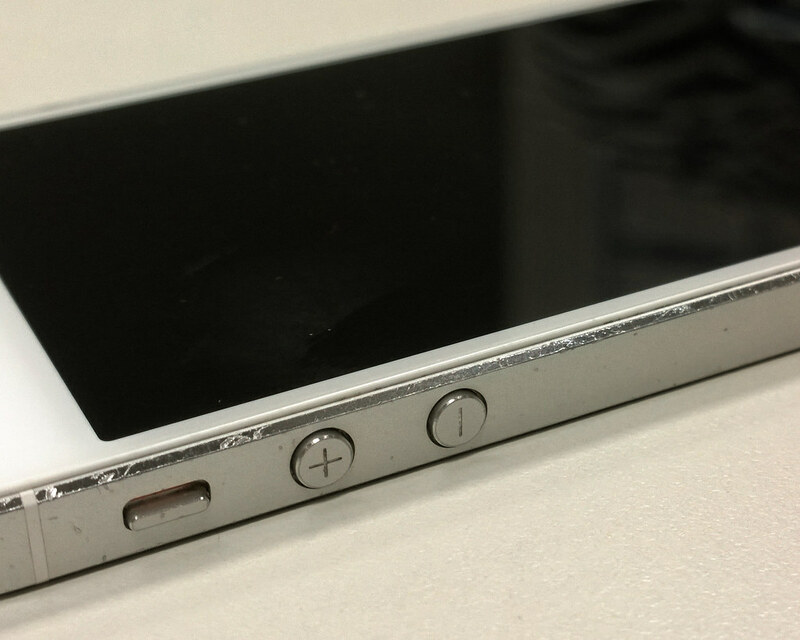 The small increase to 4.5″ seemed to help a lot as I did not do so many typing errors etc. Still a relatively small phone and screen in 2015. From the era of phones getting smaller we are going backwards nowadays.. 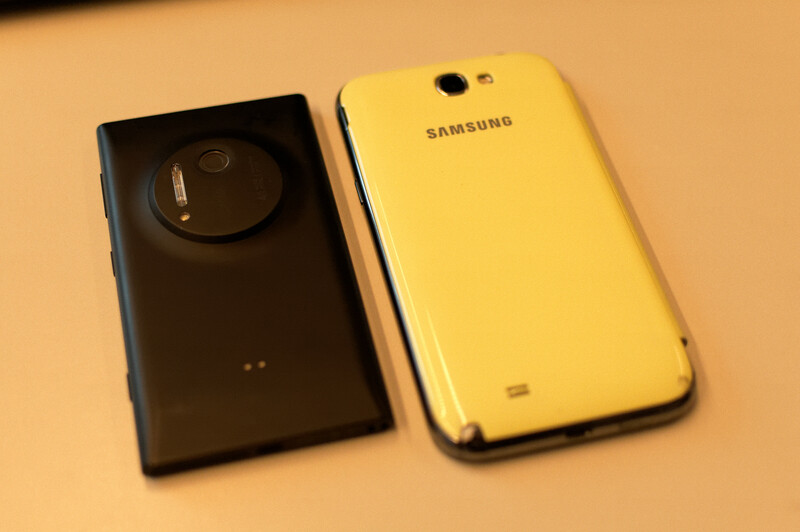 Comparison photo in size to a 5.5″ phone. Not that much in it. In the back you can see the cameramodule as a small hump. Actually grew to like it as it was something to hold onto and the phone felt way more secure than it would have otherwise. One of the great things about the phone and the WP8.1 running in it is this. Glance-screen. 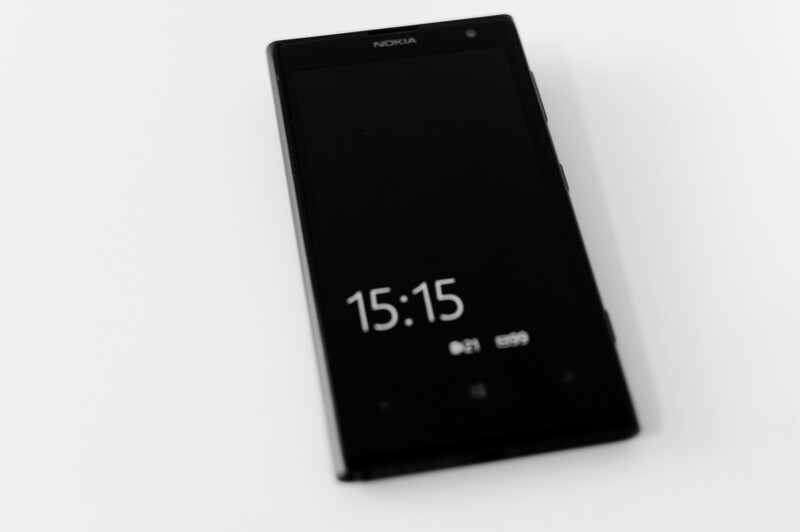 You have the clock etc showing like in the old Nokia phones like 6110 or 1100 and no real penalty to the battery usage. This in my opinios is a great feature, as with most phones, you need to activate it to see the time, or to check if you have new messages etc. And every time you needlessly open the screen it uses the battery. Continuing on the topic of Windowsphone 8.1. Having extensively used both Android and iOs in pretty much all their iterations I have to say. I do not understand the fuss about WP being a bad operating system. It is different. But everything works well and swiftly. The configuration into use from the box was very easy. All in all it took me maybe 5 minutes to learn where everything is. The only things I did not like about the OS was that every single app seemed to require to know my location. Privacy is admittedly getting smaller all the time, but it would be nice to be able to choose. The built in camera app in action. 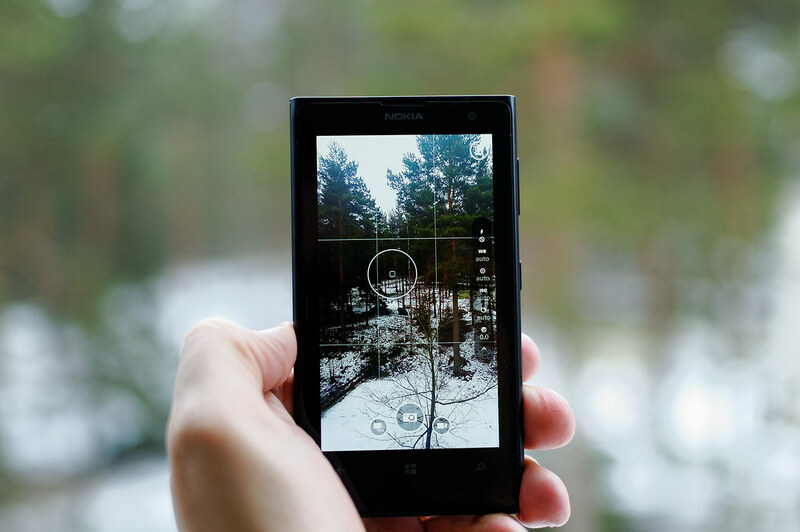 The basic camera is easy to use, just either open it with the dedicated camera button or open the camera app. Click and you are done. Bacic setting is: 5Mpix +38Mpix photo captured. The latter is better to edit on the computer and the 5Mpix version is good for sharing stuff on the phone. The added benefit is cropping or what some may call digital zoom. Lot of real estate to crop from in the full resolution photo. The phone was also the first to do DNG from the factory (Raw photo which has more latitude in editing). The second post will show photos taken with the phone as well as thoughts on the camera part.